Mike and I have been taking a small break from the issue of the exhaust system. We will post an update when we get the show back on the road on that issue, but for now, we have lots of other projects to keep us busy. In the ‘cheap and easy’ category, a category I wish included more things, I’ve finished the aft head walls. Boats need to be easy to clean but in my book that doesn’t mean we can’t have a little fun with the kinds of finishes we use. So when I recently ripped the wall paper off the wall in the aft head (because there was nasty gross disgusting mildew behind it) I decided I would paint those walls in colors that glowed. The walls would be beautiful, and the warm tones would make my skin look better in the mirror. That’s right. It’s all about vanity, people. Preparation is the better part of valor when it comes to paint finishes. So after ripping the wallpaper off (really it practically FELL off the wall) I scrubbed them with bleach water, then sanded them and primed them with a stain and mildew killing primer. That complete, I was ready for the fun. Inside the boat there is no need to use expensive ‘marine’ paint. We can get away with using many products that are the same as what we would use in our land based homes. 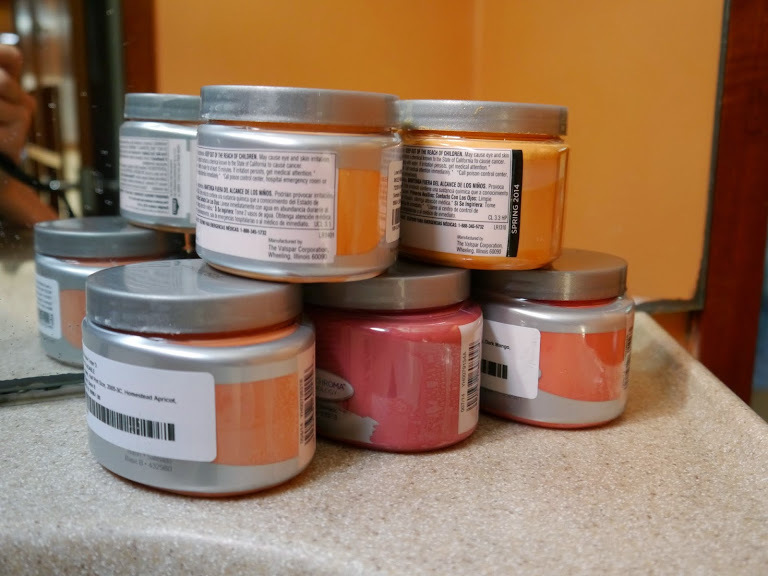 Thus I discovered that at Lowe’s I could buy samples of latex paints, 7 ounces each, that they would custom tint in any color I wanted. The cost? 3$ each. This is a dangerous temptation for a woman who loves color like I do. On the other hand it brought the cost of this cheap boat trick to only about 25$, including paint and supplies. Deal! This finish involves layering color in a subtle way. The result is a wall that has what I call ‘color texture’. There is an overall impression of color, but when you look closer you see that it’s actually many colors. And instead of a flat look, there is depth to the color that gives the impression of texture on the wall. I love it. This is the kind of project you can do while you have other things going on because there is a lot of time to spend watching paint dry. Here’s what you will need: latex paints, a clean polishing pad (the kind you use with paste wax or car wax that is basically a round sponge with a fine terrycloth covering), a stiff square tipped artists paintbrush, water, a paper towel, a clear finish like clear polyurethane and your imagination and sense of playfulness. To do this kind of finish well I suggest you use big, bold colors. Choose colors that are rich and deep. Frankly, I’ve tried this technique with pale colors at home and was less impressed with the results because the pale colors tend to disappear into each other. There is not enough color tint as they are mostly white when you spread them out. Just saying, be bold. Think ‘sumptuous’. Choose colors that play well together. I chose my base color, the one that I wanted to dominate the effect. Then I chose 4 other colors that would look good with it. As a rule, stick with either cool or warm tones. You can do this effect with only 2 or 3 colors but there is a balance here. Too many and your wall will look like mud. Too few and it’s hardly worth the effort. I also like to have enough choices to play with, and at 3$ a pop, it’s not going to break the bank to be generous. Begin by painting your walls with the color you’ve chosen as your base. This will be a strong color and needs to be one of the darker tones in your selection. You will be layering other color on top of it and if you start with a light color you’ll just cover it up. Save your lighter tones for the layering. If you pick a color that is sort of ‘in the middle’ of your chosen field of hues, you can’t go wrong. I chose to begin with Sweet Mimosa, a color that looked pretty much like ‘tangerine’ on the walls. Even by itself it was lovely. Once your base coat is complete, walk away. Go do another project. Let it dry overnight. You want the walls to be completely dry before layering. Go ahead. Just pick up a little color and wipe it on the wall like you’re in kindergarten. Now the fun begins. Your goal for this part is to pick up very small amounts of another color of paint, using a barely damp (not sopping wet) polishing pad. You might want to practice this part because there is a ‘feel’ to it that you will need to discover. If you use too much water, it will drip down the wall and ruin the finish. If that happens, just wipe it with a sponge and add more color. No worries. You will be spreading the color so thinly that it leaves just a hint of its former self. It’s okay if parts are darker than others. That’s part of the charm. I encourage you to play with it until you get an effect that you like. Pick up a little bit of color (notice that the applicator pad is almost dry) and then wipe it on the wall with quick, deft motions. Act like you know what you are doing. Pretend you are putting makeup on the wall. You want coverage but it can’t look like it’s caked on or it will be obvious. This will be blended further. Do this one color over the entire room until you are satisfied with its transparency, adding a little more here, taking more off there. Step back frequently and view the entire area you are working on to get the overall effect and check for drips. Use arcing motions with your hand, or crosshatches, or circles. Just play with it until you like it and then stop. Let this coat dry for several hours. It needs to be completely dry before you add the next layer. In fact, if there are any hard and fast rules for this effect they are to use less water rather than more, and let each layer dry completely before adding another one. Otherwise you will have a muddy mess. You might have to experience that to believe me, so go ahead. You can always paint over it. Here is what the wall looks like after the first layer. When this layer is dry, choose another color. Repeat the process. You will notice that when the colors are thinned out like this, they bear little resemblance sometimes to what was in the jar. This is part of the fun. I chose the raspberry colored paint next to add a bit of red to the mix. I wanted the walls to look like a sunset. These colors are just delicious. Here’s the wall after adding some of the raspberry and some of the darker mango hue. I was happy with how this looked so I decided that was all the colors I would be using. In all I used 4, including the base color. Yes, the differences in the two photos are very subtle. That is deliberate. It is the overall impression of color I wanted, not 4 distinct colors on the wall. If you are not very sensitive to color variations, this technique will cure you of that. The final touches are done on the small areas like between cabinets, in corners, and close to the wood trim pieces where the sponge would just make a mess. I use a stiff square artist’s brush. The squared end allows you to get close to the wood trim and make a sharp edge. Don’t use the soft bristled kind. You’ll just frustrate yourself and the cheap ones always lose hairs. You’ll spend all your time picking them off the wet paint. Learn from my experience and just don’t bother. To do the small areas you’ll use this brush almost dry but there’s a technique to this. The secret is to use the paint lids. Put 2 or 3 drops of water in the lid to thin the paint just a bit. Don’t overdo it. Touch your brush to the thinned paint, then lightly press the edge on the paper towel. You want to let the towel soak up some of the moisture and leave some color behind on the brush. Use a scrubbing motion to rub the color onto the small areas. Again, the brush will be almost dry. You can add one or two drops of water to the brush if you need to. The word ‘drops’ here means exactly that. If you are tempted to use more you will find it runs and ruins your previous work. Again, my experience at work for you. Do not yield to temptation. Jiggling and scrubbing the paint onto the detailed areas. A sharp fingernail inside a damp paper towel cleans up those edges. Here is the wall when all the color has been applied. The final touch for this wall is to clear coat it with something that will make cleaning easy and create a hard finish. Always looking for ways to use up what I already have, I checked the big paint cabinet at home and found a can of Spar Urethane, previously used to refinish bedroom floors. Perfect. This product dries to a hard, satin finish, is water based, and has a slight yellowish cast which works perfectly with these walls. If you need to purchase something for this step, I suggest going to the craft store and buying a small can of the finish of your choice because you will use so little of it. In fact, you use very little of all of the products except the base color. You will have plenty left over to use somewhere else, making this trick even cheaper. Cheap, easy, and flattering to my skin. This one is a win! This entry was posted in Uncategorized and tagged boat interiors, Cheap Tricks by Melissa. Bookmark the permalink. Nice work – love it! Looking forward to seeing what you do with your new boat’s interior! Very well done explanation with photos. Thank you artiste Melissa. I am afraid of paint. Preparation is key for sure. This has given me some more confidence. Paint is your friend, Al. And it is very forgiving. If you don’t like it, you just paint over it! Good to know about the little paint sample pots! A more reasonable amount of paint for boat-sized projects. Thanks for sharing! And thank you too for the reply the other day! I’m not on FB, but if there are any other ways to connect with the sailing group, I’d love to get involved. Our boat is an Ingrid 38. The sails are going on this weekend so we should be sailing soon. Hope you also get back out on the water! Your boat is lovely. I checked out your blog and wow! You have really hit the ground running with that boat. Maybe we will see you out there this weekend. We plan to leave the dock come heck or high water so we’ll look for you. Sorry to hear you are not on Facebook. If you ever want to join the group, you just need a personal FB page, but you don’t have to actually USE the page. Only have it because that’s how you join groups. So so beautiful! I love it!! Looks even better in person! I can’t get out this weekend, but Next weekend for sure…. gotta warm up for the long trip to the San Juan islands! see ya tonight! Break a leg, John! Looking forward to the show.